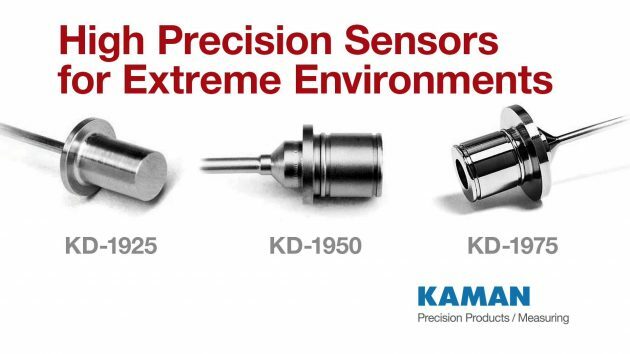 The Measuring Division of Kaman Precision Products, Inc. has announced the availability of its line of Extreme Environment high-precision displacement sensors and systems. With their proven design and rugged all-welded and hermetic construction, the sensors and systems are ideal for rocket and turbine engine validation testing. They are also an excellent choice for other applications that require high accuracy, high reliability, and structural integrity, including nuclear reactors, steam and gas turbines, chemical processes, and high temperature processing. Three separate systems are available, specifically designed for high pressure, low temperature, and high temperature conditions. The Extreme Environment sensors and systems work in operating temperatures ranging from -320°F to +1,000°F (+1,200°F short term). Displacement systems withstand pressures up to 5000 pound-force per square inch (psi). Their dual-coil sensor design effectively minimizes temperature effects. All of Kaman’s high temperature transducers are made with hermetically sealed, all laser-welded Inconel housings and use and Inconel-jacketed, mineral-insulated cable. The sensors are unaffected by environmental contaminants and can withstand corrosive gas or liquid environments. The KD-1925, KD-1950 and KD-1975 Extreme Environment displacement sensors use KDM-8206EE signal conditioning electronics. Available are a full variable channeled rack (with up to 12 channels), a half rack system (with up to 6 channels) and the NEMA housing enclosure. Backed by an established aerospace company that has been an industry leader for more than 70 years, the Measuring Division of Kaman Precision Products follows rigorous aerospace quality systems. The manufacturing facility is certified to AS9100 and ISO 9001. Kaman offers high-precision, electro-mechanical contract manufacturing at its 215,000 square foot facility, which has 150,000 square feet of manufacturing area and 230 employees.